Most likely you have never heard about this magic course. When I think about a 'magic gem' I have these 25 volumes in mind. This course could be called the 'British Tarbell Course' and in many respects it is much better than the Tarbell Course . It came out around the same time Tarbell issued his course and it had the same intent, to take a novice, introduce him to magic in a serious and thorough manner and give him all the information to develop him into a performer who can earn a living from performing magic. Rupert Howard's course does not cover as much ground as the Tarbell on trick technique, but quantity is not necessarily equal to quality. 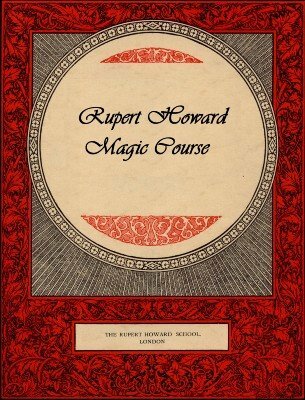 Howard also adds a bit of magic history spread out through the first lessons - not too much to overwhelm the beginner but enough to keep you interested and teach you some of the most important historical facts. It covers all major forms of magic from cards, coins, ropes, silks, balls, paper, cigarettes, thimbles, mentalism, illusions, escapes, and all the essential parts of the business from marketing to the appropriate dress and attitude. 1st edition 1931; 556 pages.